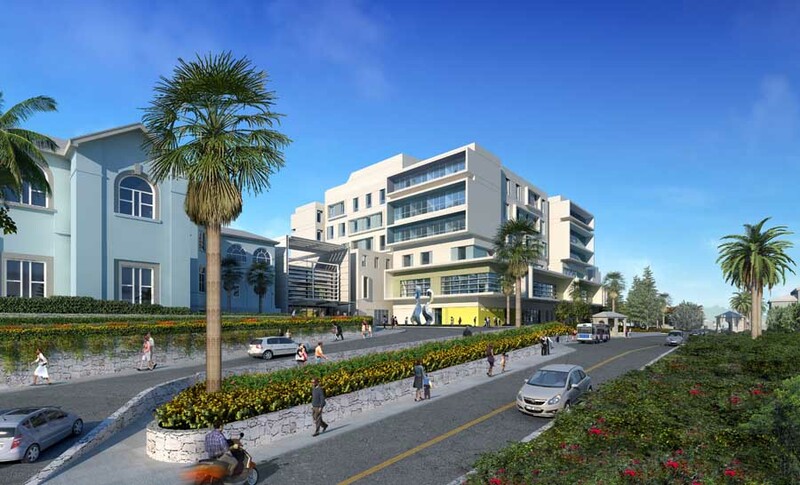 SHCA, part of a consortium lead by Sir Robert McAlpine in the UK and BCM McAlpine in Bermuda, has designed a building to support the highest quality of acute care health service possible on the island, combining clinical excellence with a strong Bermudian character. Architecturally the building is in harmony with the site and achieves high sustainability levels and LEED score, providing a therapeutic environment for patients and exemplar working conditions for hospital staff. The upper levels of the building are organised around a central four storey atrium with skylights – a naturally lit volume which serves as a central element about which the inpatient bedroom floors are arranged. This has allowed the development of inpatient bedroom floors that are subdivided into “neighbourhoods” or small clusters of rooms arranged about this central atrium. The atrium is a positive distraction, bringing natural light into the building centre and serving as a landmark to enhance patient wayfinding. The floor of the atrium contains Surgical Reception, Waiting area and Stage 3 Recovery. The design of the lower level diagnostic and treatment care areas is carefully integrated with the floors above with a clearly defined circulation system based on the atrium and patient room clusters. The primary corridors on these deep plan floors provide direct visual links to the surrounding landscape, taking advantage of the unique Bermudian environment and providing natural light to all patient zones. The facade concept for the building has been developed by using the local island Bermudian architectural context as a visual reference. The analysis of the building distribution on the island identified a pattern of pavilions which appear to ‘float’ within the landscape. The facades concept for the new hospital has been broken down and scaled in a manner try to emulate this metaphor of “Floating Pavilions within the Landscape”. As a result the scale of the new building integrates with the surrounding context and is further enhanced by the selective use of strong colour on the exterior envelope, common to Bermuda. The design team includes: SHCA London and New York offices, OBMI – Local Associate Architect, AECOM – Services Engineer and McFarlane Wilder – Landscape Architect.